But the researchers made a remarkable discovery. 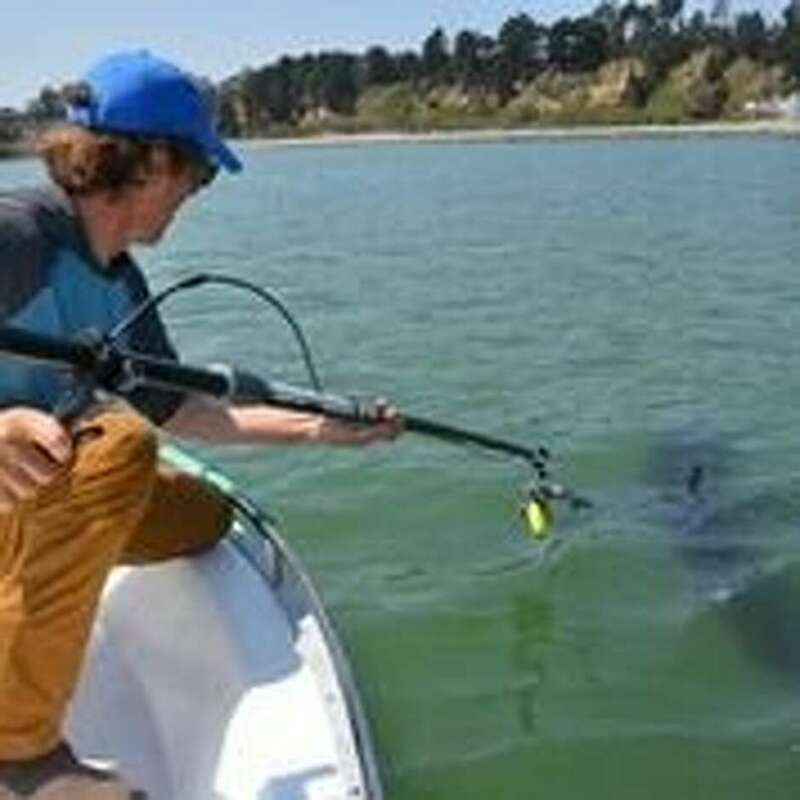 Instead of blank, barren sea, the expedition, led by scientists with Stanford University and the Monterey Bay Aquarium, found a vast community of tiny light-sensitive creatures so tantalizing that the sharks cross the sea in mass to reach them. To find out, Block organized the month long expedition in April and May aboard the Schmidt Ocean Institute’s research vessel Falkor, which was equipped with high-tech instruments, sail drones and a remotely operated submarine. 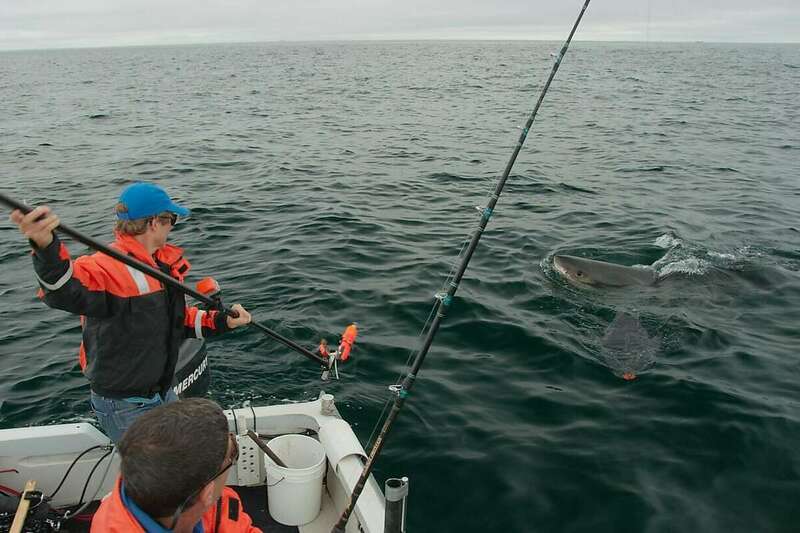 Last fall, before departure, her team of scientists tracked down 36 local sharks using acoustic signals and fitted them with high-tech satellite monitoring tags with locator beacons programmed to pop off and float to the surface during the cafe expedition. A great white shark was seen chomping on the carcass of a whale on July 19, 2018 by the crew of an All Water Charter boat. Scientists in recent years have discovered hundreds of new species in deep water zones like this one. The uniquely abundant mass of fish draws all kinds of predators, like small cookie cutter sharks, which have evolved light-emitting organs called photophores on the underside of their bodies that act, to prey, like invisibility cloaks. The white sharks aren’t the only large predators tracking the mid-water creatures. Squid-eating big eye tuna, blue and Mako sharks also frequent the cafe. 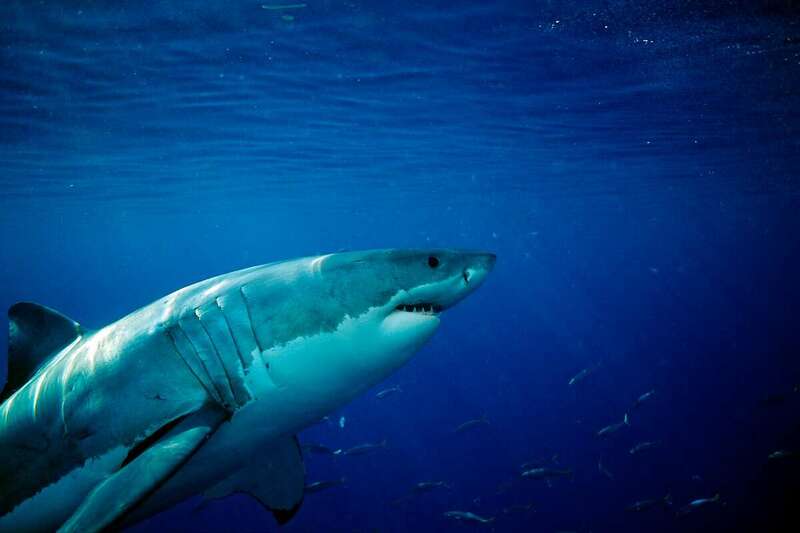 Jorgensen said these larger fish may be what the white sharks eat, but there isn’t any definitive evidence of that. 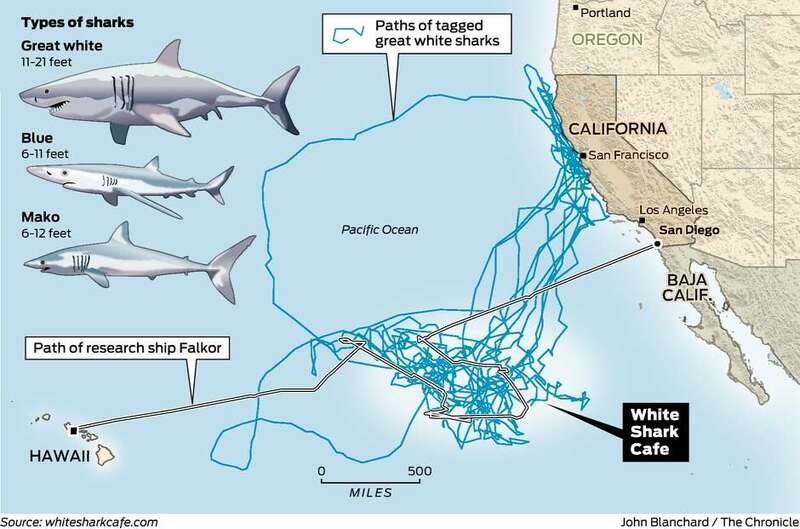 Triggered by some cryptic mechanism, the sharks leave their mid-ocean sanctum during the summer and begin to gather along the coast of California around August. 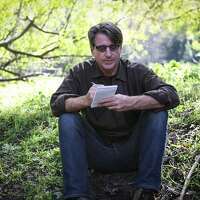 Peter Fimrite covers the cannabis industry and the environment, including ocean and river habitat, fisheries, the forest ecosystem, climate change, drought, Native American issues and conflicts between ranchers and predators in the western United States. A former U.S. Forest Service firefighter, he has covered most of California’s deadliest and damaging fires, including examinations of the conditions that helped them spread. He has traveled extensively and written about a wide variety of issues during in his career, including the Beijing Olympics, Hurricane Katrina, illegal American tourism in Cuba and the history of automobile travel in America.